I learned to sew when I was 12. My mom taught me how to follow the pattern and cut on the bias, how to add elastic and sew on buttons. The result was a complete set of pale yellow pajamas printed with a pattern of little cupcakes. I loved those pajamas. Sadly, the pants were too short and I never wore the shirt, because I couldn’t be bothered with buttons before bed. But I still loved them. In the beginning, sewing comes with a whole lot of rules. Rules about tension and stitch length, rules about where and how to cut the material. Different fabrics even come with different rules. I never bothered to learn all the rules. It used to make my mom crazy that I would get an idea and try it without any concern for the rules. Most of the time my projects ended up in choppy piles in the trash. But once in a while, I’d know just what to do with the material in front of me. My fingers would guide an old pair of jeans under the needle for hours. I’d remember to backstitch and trim loose threads. I would focus and keep my hands steady. And when it was finished, I would turn my masterpiece right-side-out and sling the repurposed jeans-turned-messenger-bag over my shoulder. It took a few years of sloppy pajamas and ill-fitting bridesmaid dresses for me to figure out that my best work with a sewing machine came when I used fabric that had already been something else. A cushion cover becomes a clutch. A tablecloth becomes a skirt. Jeans become a bag. I have a collection of discarded stretches of material and I can see the potential for new life in each of them. I can tug at the existing seams and see which directions the material stretches and what kinds of stitches held it together once before. I can see if previous construction wore the fabric out in certain places, leaving it vulnerable and weak. And that’s when a new vision comes into view—when a new purpose can take shape and when I can do my best work. My habit of repurposing isn’t just a reflection of my Pacific Northwest need to recycle or my hope for sustainable fashion and justice for garment workers. It speaks to me of redemption. It speaks to me of old and worn being re-birthed into something fresh and glorious and new. It speaks to me of Heaven touching earth and a resurrected King who brings healing and hope. 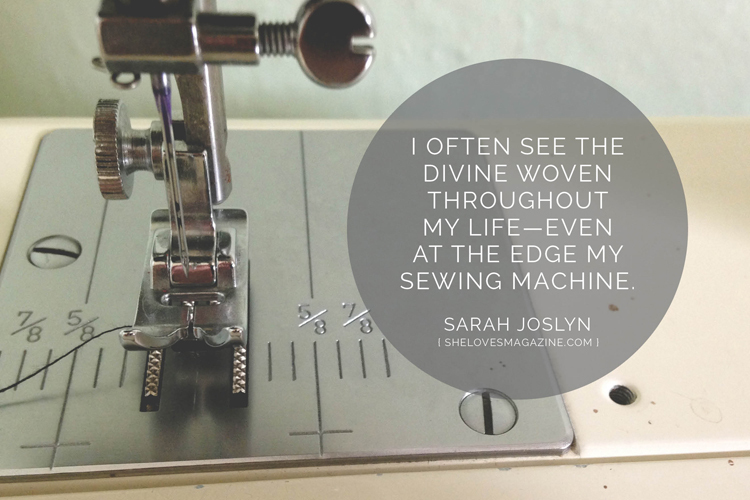 I don’t tend to rely on simple analogies to explain or justify my faith, but I often see the divine woven throughout my life—even at the edge my sewing machine. We’re taking our theme a new direction this month with FABRIC. It’s easy to see the tangible way we interact with fabric—we find ourselves robed in fabric and we settle down to rest under the protection of it. But there is more to this word than a set of bed sheets or a favorite t-shirt. We also see a weaving in the world—in relationships, in our spiritual formation and in the ways we create. The posts this month are going to explore several interpretations of fabric and I am grateful for an opportunity to start us off with mine.